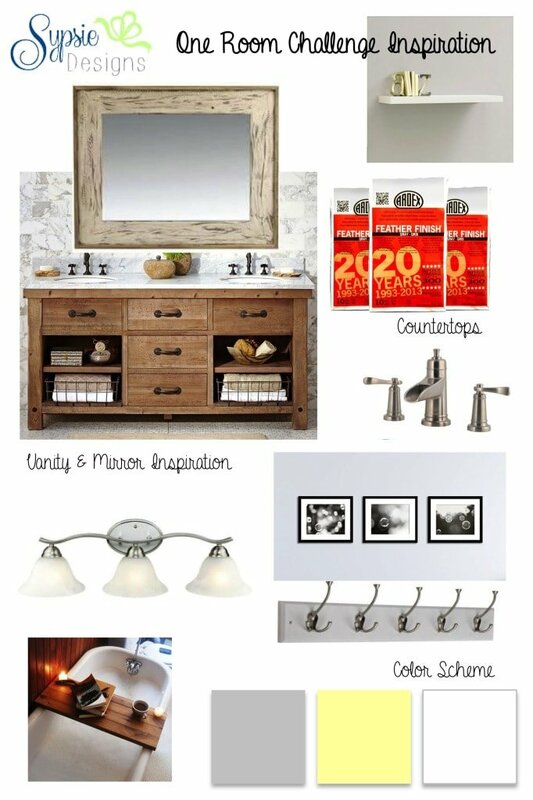 Welcome to week two of the one room challenge! As a refresher, we’re participating in a one room-six week-makeover challenge hosted by Calling it Home where 20 design bloggers take on the challenge and other bloggers (us!) 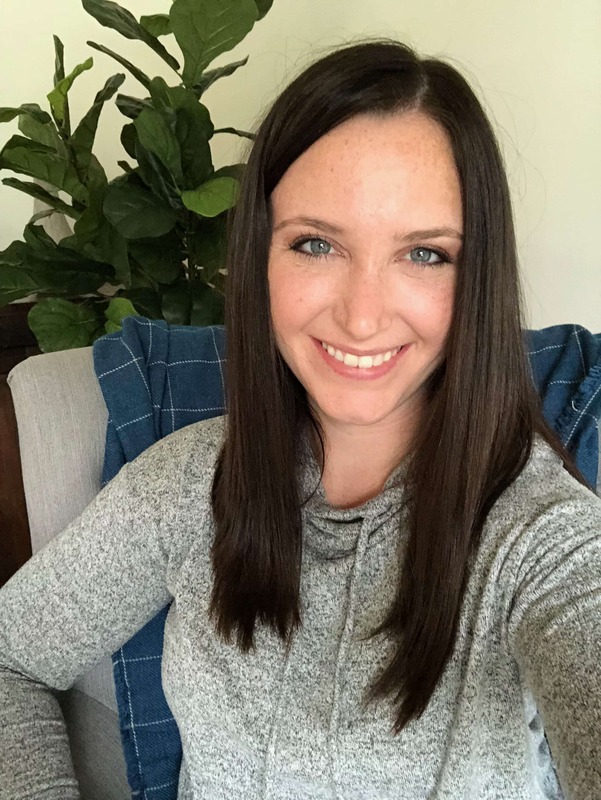 participate in a link up each week! Today, we wanted to check in and share some of the progress that we’ve made! Most of it is in the “demo” mode right now, but there are a few things that have been upgraded as well. 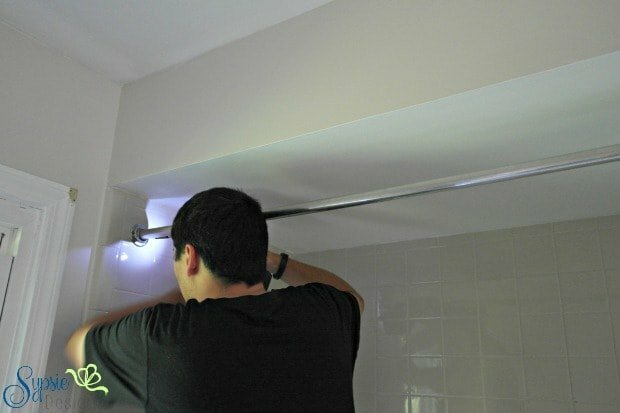 First off, lets start with something that’s finished- we fixed that terrible shower curtain and rod! 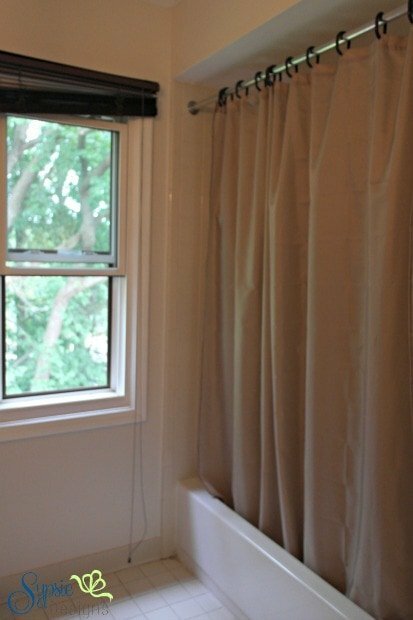 Here’s what we were working with before, and here’s the space with a new curved rod and the curtain that is serving as my inspiration for a gray, yellow and white theme. 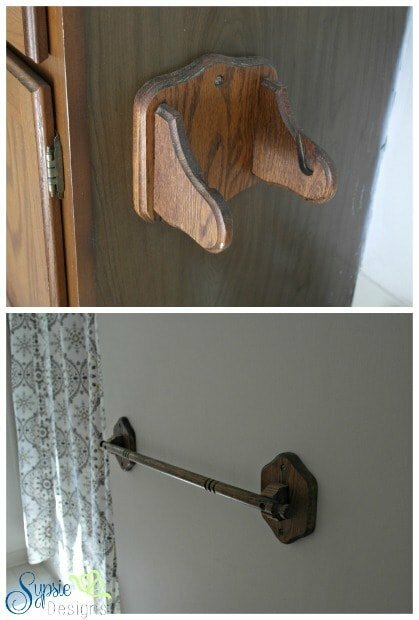 The curtain rod was from our old apartment and the curtain has been sitting in my stash for almost a year, so luckily this part of the project didn’t cost us a dime to do! It’s amazing how much bigger the shower feels by just adding a curved rod, although it may not really appear that way in these pictures. Just take my word for it : ) The old rod was drilled into the tile so we chose to keep the new rod in the same spot to avoid drilling into more tile. One project has been marked done! Our second “completed” part of the room is the light fixture. 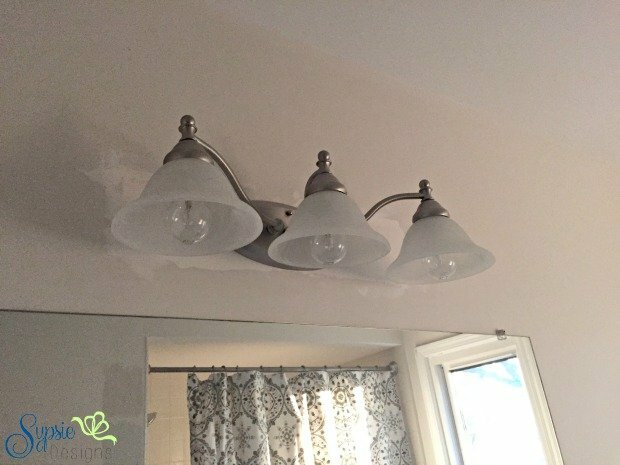 As I mentioned really quick in the week 1 post, we had a really old and gross light in this bathroom (somehow I do not have a single before picture- blogger fail!) and the google machine is not showing me anything close. So, just picture something so old and not clean it’s humorous, filled with mirrors and glass and burnt out bulbs we weren’t sure how to change. 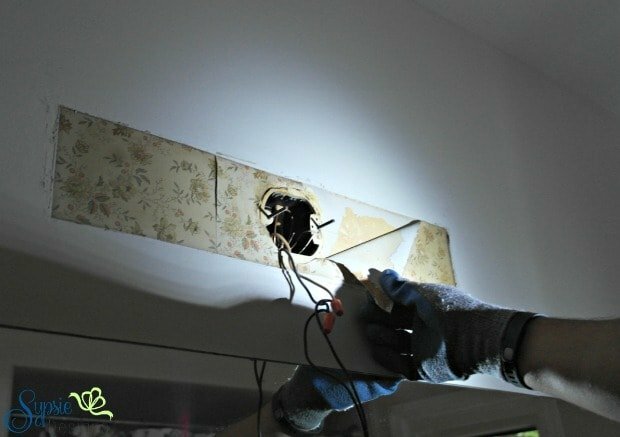 When we removed that bad boy, we found out that the bathroom used to have not one, but two types of wallpaper, and had been painted many many times before. Aka lots of layers of spackle to get it back to a smooth surface. Now it’s time for some more demo! 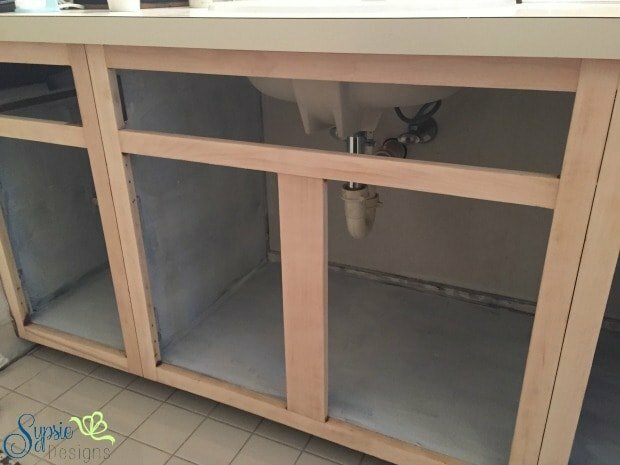 We removed the old wooden fixtures that will be replaced with stainless/nickel versions to go along with the rest of the room. 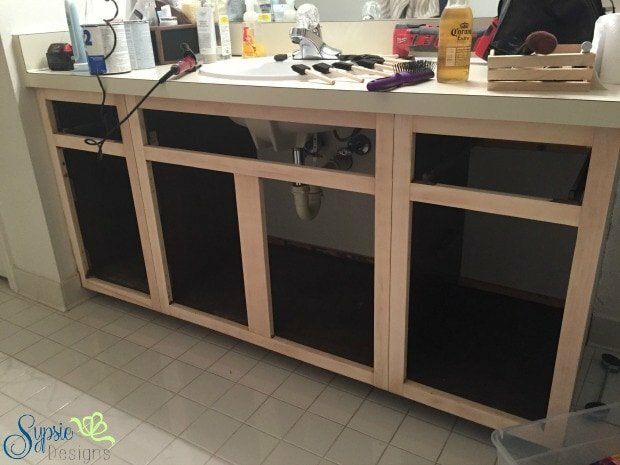 Next, we started on the vanity. 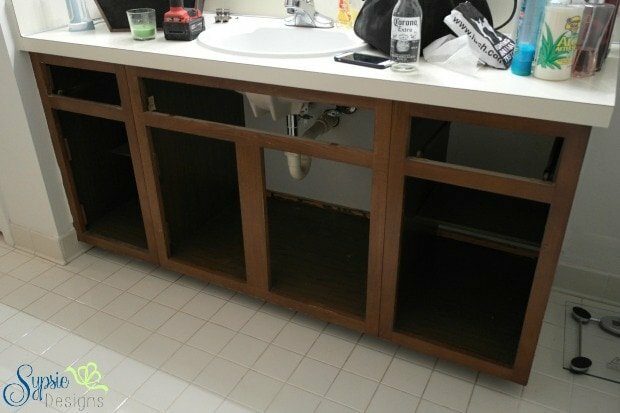 It’s actually three cabinets put together to create a single vanity, and started off looking like this. After we decided we liked this look as much as we thought we would, all of the doors came off and a lot of sanding/priming happened. Last but not least, there was one more blatant part of the room that was screaming outdated to me. 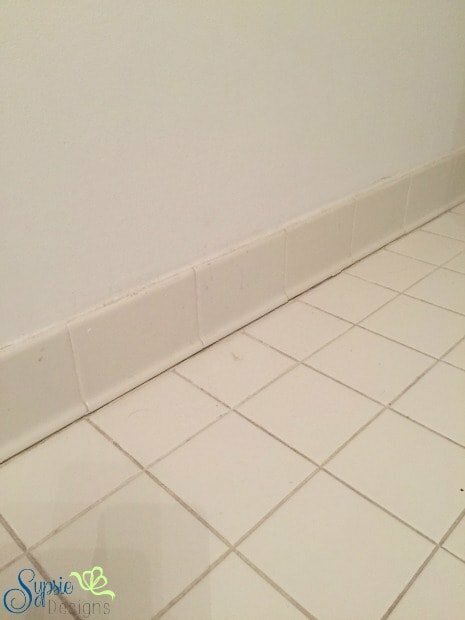 These wall tiles. I’m not a huge fan and much prefer pretty white trim. 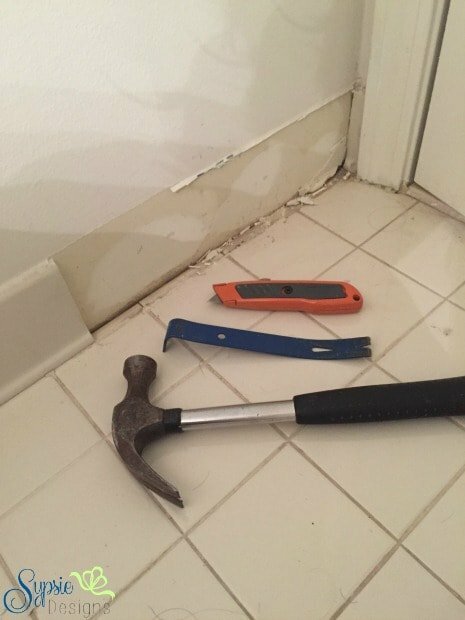 So, I grabbed a few tools and got working on removing them. It was much easier than you’d think- just be prepared for a gross mess behind them and keep a vacuum handy! 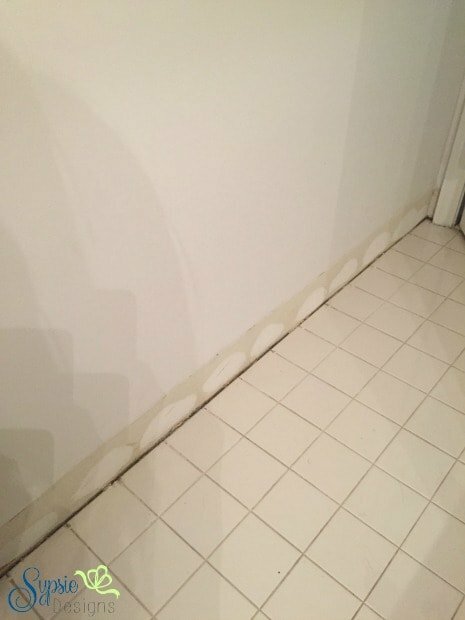 It may not look better right now, but the end product will be much less dingy which is what I’m hoping will help the tile look less dated as well. After a good grout cleaning (not looking forward to that) I think the space will look so much more fresh and so clean clean. So, that’s our progress for week 2! A little updating and a lot of demo : ) Only 4 more weeks until the reveal and I can’t wait to keep working on it! Hope you’re having fun following along, and if you’re participating that your room is coming along beautifully! Wow you made a ton of progress! Looking great so far. Thanks Tiffany! Excited to keep working on it : ) So far I’ve made a mess and can’t wait for it to start coming together haha! Major progress!!! Can’t wait to see more! You’ve done a lot of work and it’s already looking so much better! 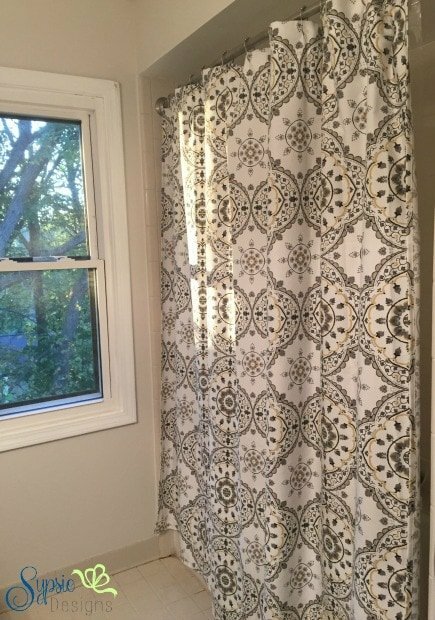 I love the shower curtain, and I especially love the direction you are headed with the open storage on the ends of the cabinet! Loving everything! 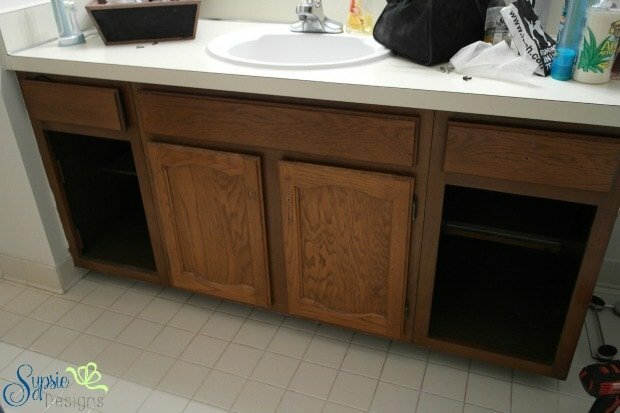 Taking the doors of that vanity is going to be such a major difference. Thanks Melissa! I’m hoping it turns out like what’s in my head 🙂 excited to keep working on it! Thank you Erin! Hope you have a fabulous day! I love that you removed those wall tiles. So much better! I can tell, this is going to be a huge ‘after’. Great work. Thank you so much Linda! You are too sweet 🙂 This is such a fun challenge! I absolutely love the colors you’ve chosen! 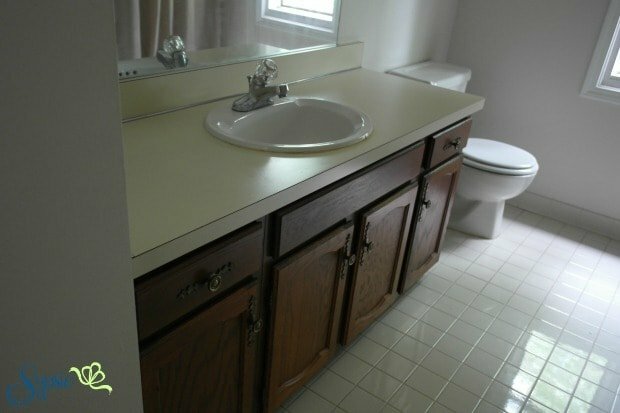 Your bathroom will be beautiful! I can’t wait to see the final reveal! What great updates you’ve completed so far!! Can’t wait to see more! Good luck this week!